The Air-Stirrup Universe Ankle Brace provides universal ankle sprain management. The patented Duplex™ aircell system provides graduated pulsating compression to reduce swelling and pain and encourage earlier ambulation for functional management of ankle sprains. For a sprained ankle ( 2 or 3 severity) what is the difference from using this and a walking boot? A walking boot will prevent all range of motion, which the air-stirrup won't. We would recommend you consult with your doctor first. Can this be worn to help heal and support a torn achilles tendon? 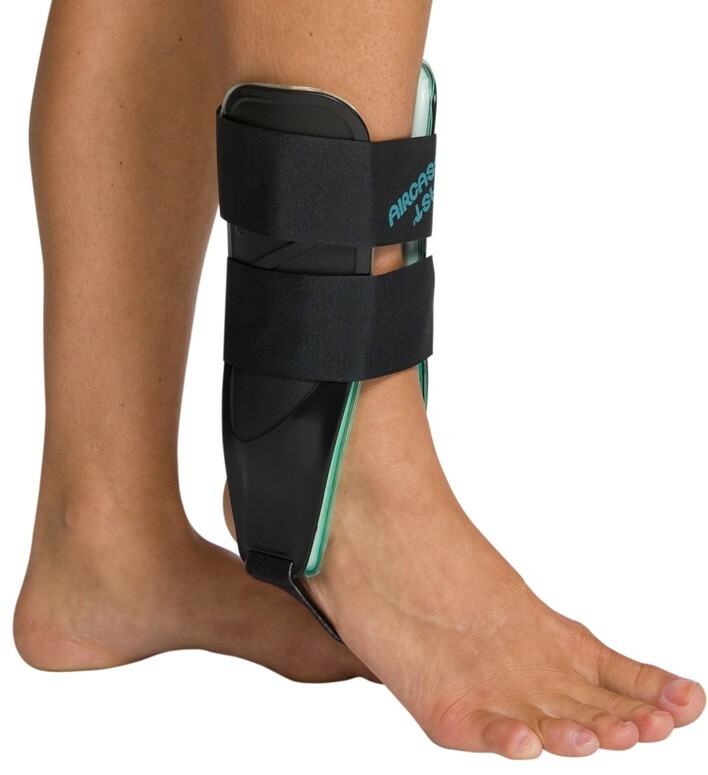 Can you wear the air stirrup ankle brace while playing sports to protect your ankle and keep it stable or would this cause more injury? No the air stirrup brace should not be used to play sports. it is not made to endure the impact of sports. I would suggest looking into either the Airsport, or the A60. What's the difference between this and the regular airstirrup brace? The Aircast Air-Stirrup Universe more of a one size fits all Ankle Brace. It is not made to specifically fit left vs right, or differing sizes. Both ankle braces will address Acute injuries of the ankle, and Severe Chronic Instability. The Aircast Air-Stirrup Ankle Brace is anatomically designed to apply to the Left or Right foot. In addiction the Aircast Air-Stirrup Ankle Brace comes in differing lengths of size, depending on your needs. Due to the more customized fit that you would get from the Aircast Air-Stirrup Ankle Brace you'll get greater and more effective compression on the joint line, which will reduce overall swelling more effectively. As with all size and left right and size specific ankle braces vs a universal brace, the Aircast Air-Stirrup Ankle Brace is going to be very much more comfortable to wear due to the anatomic design. I HAVE A FRACTURE TO MY FIBULA DISTAL TO MY RIGHT ANKLE. UNLIKE MANY BRACES ARE VERY UNCOMFORTABLE AND NO SUPPORT. HOWEVER I LOVE IT VERY EASY TO TAKE OFF AND APPLY. GOOD SUPPORT AND DEFINITELY HELPS ON THE SWELLING. IT IS THE BEST FOR STABILITY AND COMFORT. I FIND MYSELF NEVER WANTING TO TAKE IT OFF. WHEN I DO I HAVE A LOT OF PAIN. THIS WILL GET ME THROUGH UNTIL MY VISIT WITH THE ORTHOPEDIC DOCTOR. I DEFINITELY HIGHLY RECOMMEND THIS BRACE AMAZING WITH THE TYPE OF INJURY I SUSTAINED!!!! Ankle Braces fit very well for my size 12 foot. 3/2/13 Very strong construction and generous straps for a person with large ankles/feet. The black color does not get noticed by friends or others. I bought one brace for each ankle. The forms are sturdy and the straps are PLENTY long. I wear them every day and all day to protect and support my ankles. Very good service and they arrived much earlier than they estimated. I have a white Aircast Air Stirrup for my right foot and when summer gets here I'll get a another white one for the left foot to wear with lighter color summer clothes. I just got this brace today for my right ankle fracture. How nice to go from a cast for six weeks into this. I had a choice to go into the boot I had from a prior break or this one. Well the boot's heavy and this Aircast is light! Kaiser sells them, and I'm delighted. I'm so happy I could burst! Pros: Makes my life easier and better already. I appreciate the kit with all the goodies, too. Cons: Just a suggestion: how about a video with the exercises so we could follow them instead of doing them on our own completely. Thanks.